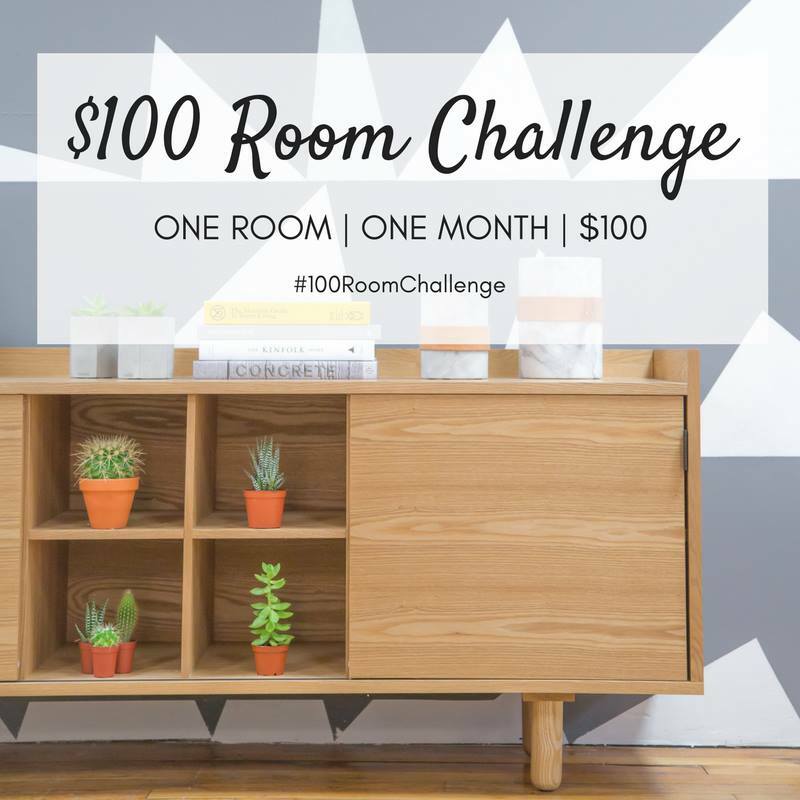 Here we are again for the week 4 update for the $100 Room Challenge. 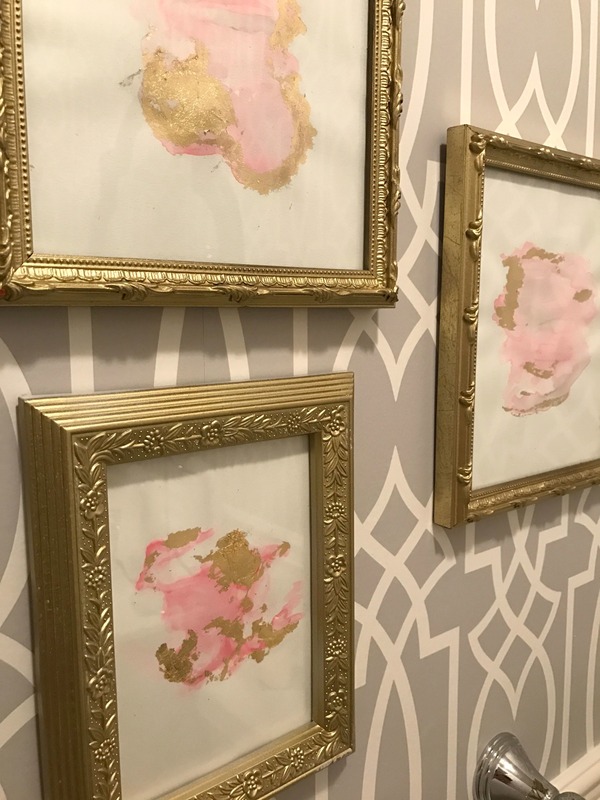 We are in the home stretch for this Powder Room Update and I’ve been hard at work this past week completing some easy DIY projects that I’m excited to share with you. 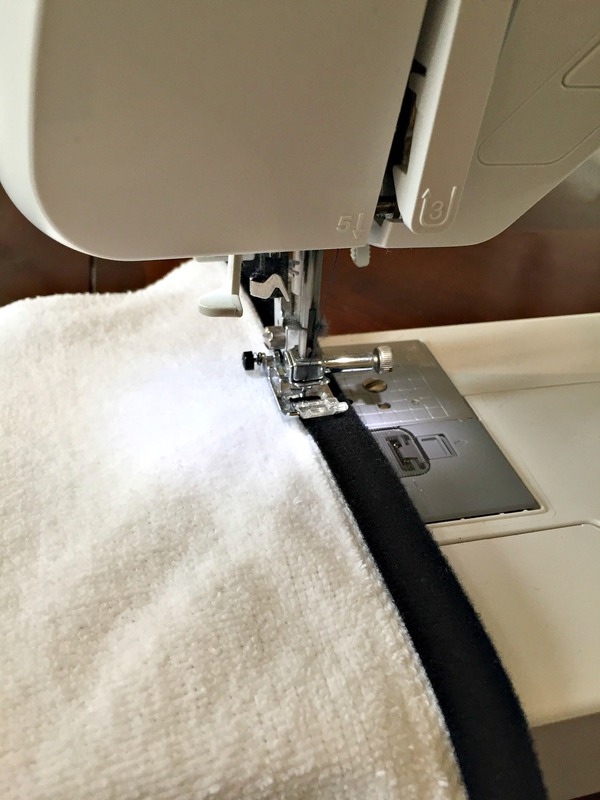 For this post, I’ll show you how I made some DIY artwork and custom monogram towels. Once again, let’s extend a huge thank you to Erin from Lemons, Lavender & Laundry for organizing this fun monthly challenge. 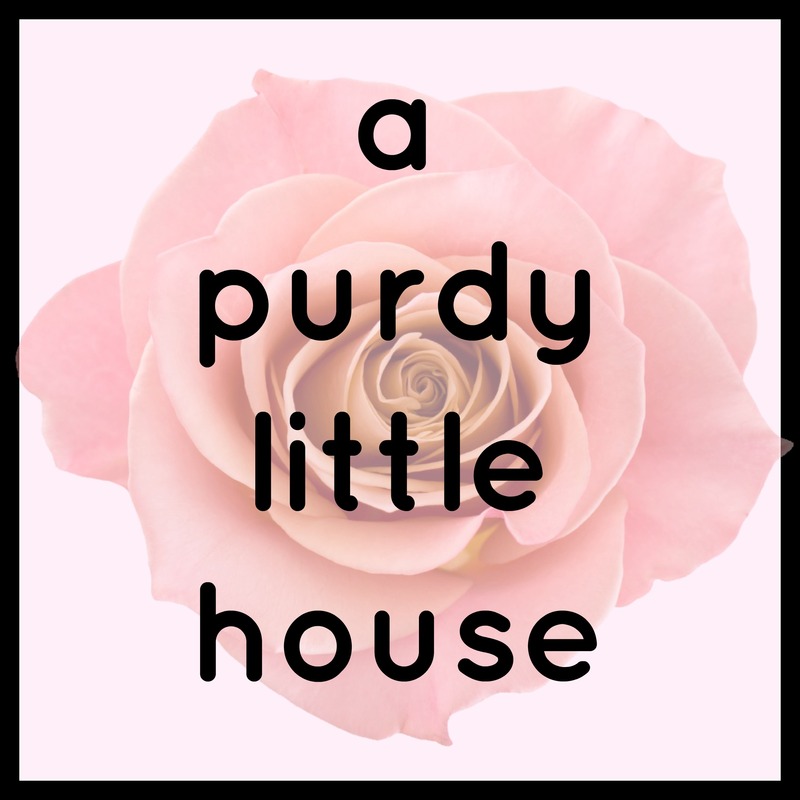 Be sure to check out all the rooms my blogging friends have been working on transforming using only $100. Links are at the bottom of this post. So, my total spent so far is $108.91. Ok. So I did go a tad over budget by $8.91. That bites. I had really hoped to stay under the set budget, but I’m still quite pleased that the room was able to come together and be completely overhauled for a relatively small amount of money. On to the projects. The DIY Art project was a fun one to create. 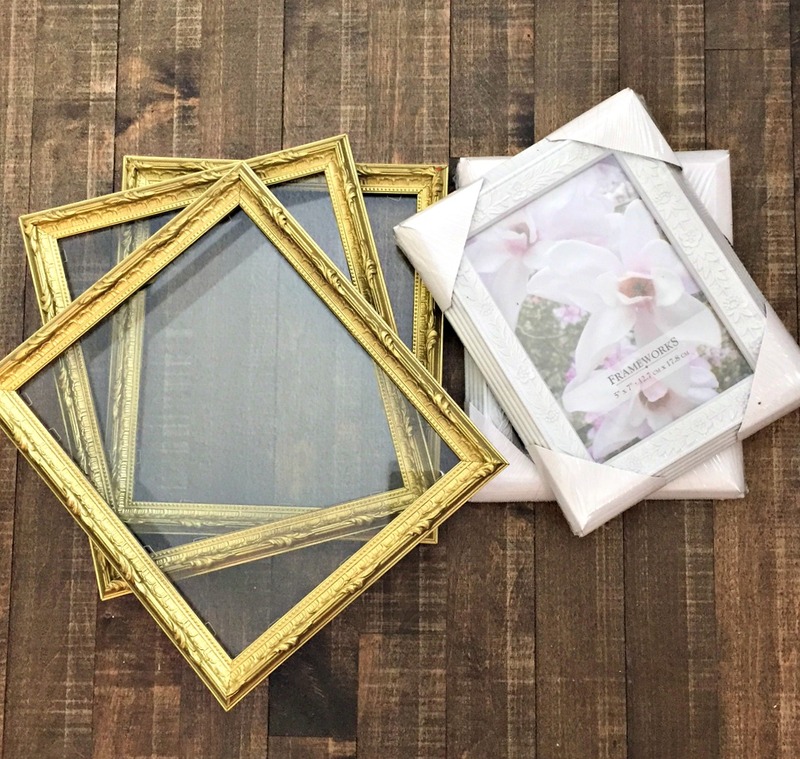 I found the three gold frames on the left through a local buy and sell group for $5.00. The other two are from the dollar store and cost $2.50 each. 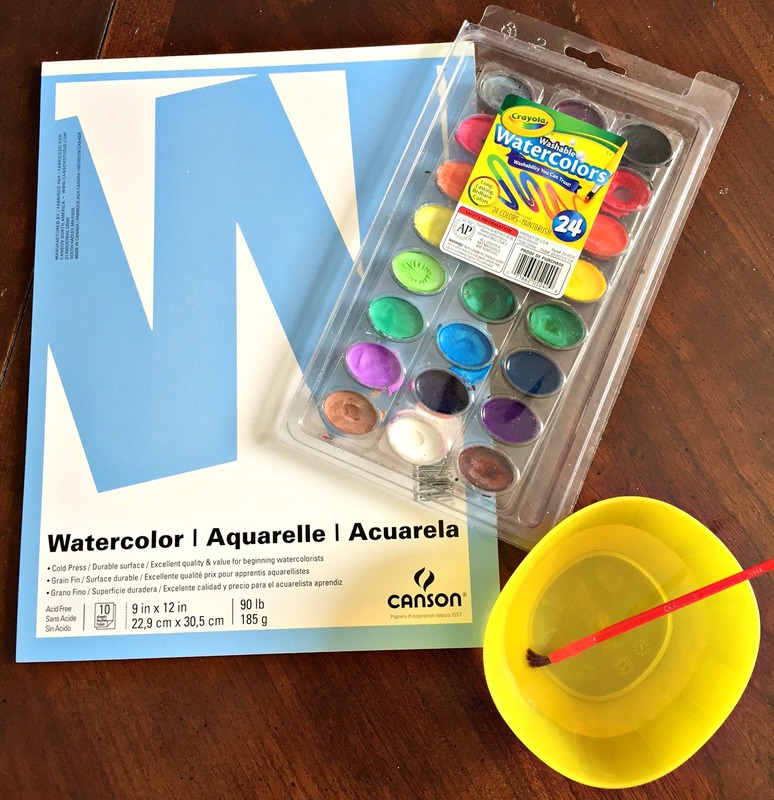 I already had the watercolour paints on hand.. well.. they actually belong to my 8 year old, but she was happy to share. The watercolour paper is from Michaels and they were having a fine arts sale, so I snagged this pad at 40% off, for only $3.97. 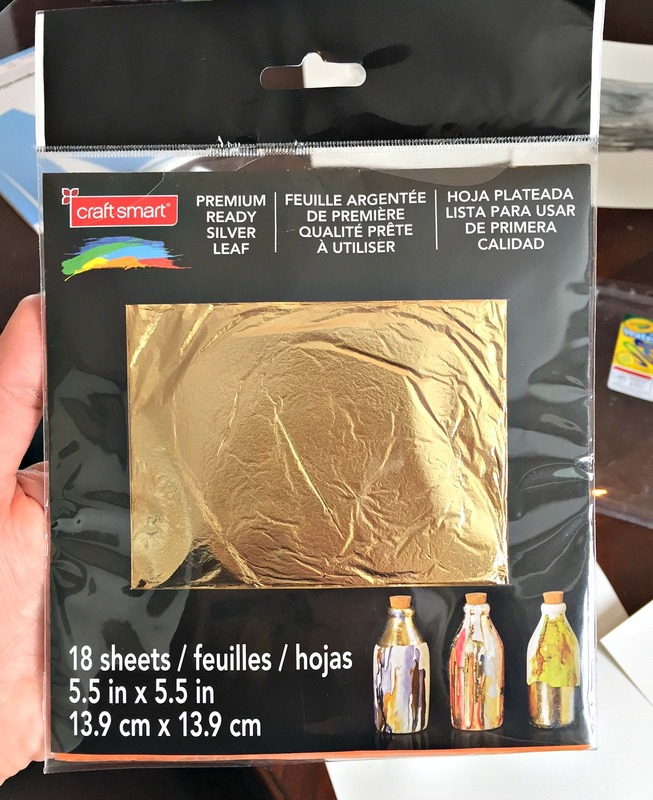 I had a 50% off coupon for Michael’s and I picked up this gold leaf for only $8.55. I was debating not purchasing it, but decided that the artwork really did need the gold leaf detail for it to pop. After I spray painted the smaller frames, I got busy with painting pink watercolour blobs. I tried to do some neat shading with the grey too, but it’s hard to tell in these pictures. After it dried, I used a glue stick (also my daughter’s) and put glue in random spots. I then applied the gold leaf, waited about 10 seconds and then rubbed off the excess with my finger. I really like how the little gallery wall turned out. The wallpaper seemed to be very feminine, so I just kind of rolled with it and used pink as the accent colour. For my second project, I scoured my local thrift store for these white towels that were only $6.96. I found four that were PERFECT and two of them had a black felt banding on the edges that I thought made them look far more expensive. I had one additional white towel at home, so I would also incorporate that into the new bathroom. 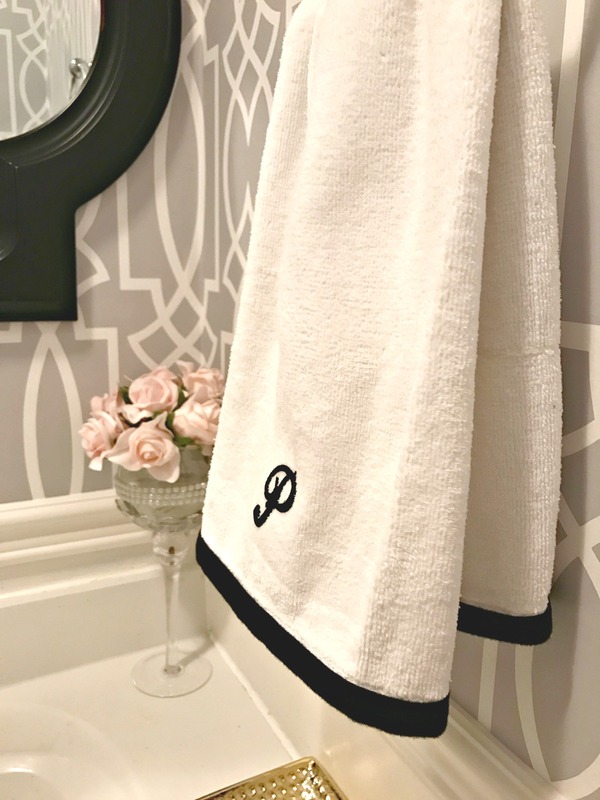 Before I started this project I knew I wanted to do monogrammed towels. I love the look, but the price of them is crazy. 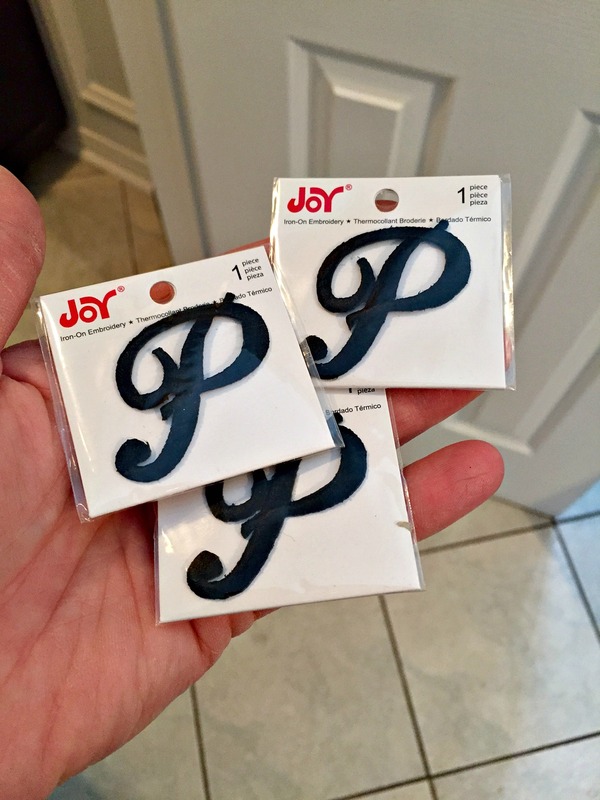 I found these iron-on embroidery letters at Michael’s for $2.50 each. I bought 4 for $10.00. 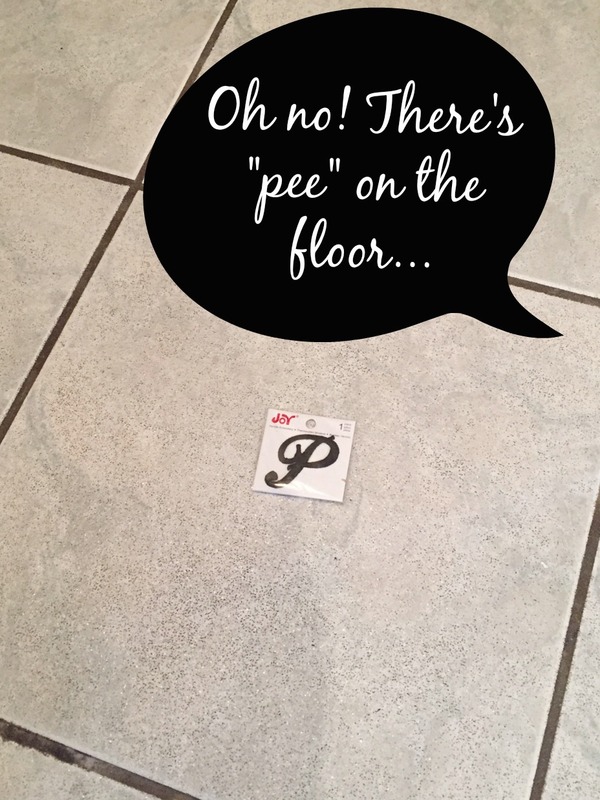 One of my kids made this joke after putting one of my letters on the floor… Lol. Since I loved the felt banding so much on the two hand towels, I wanted to mimic the same look on the other three. 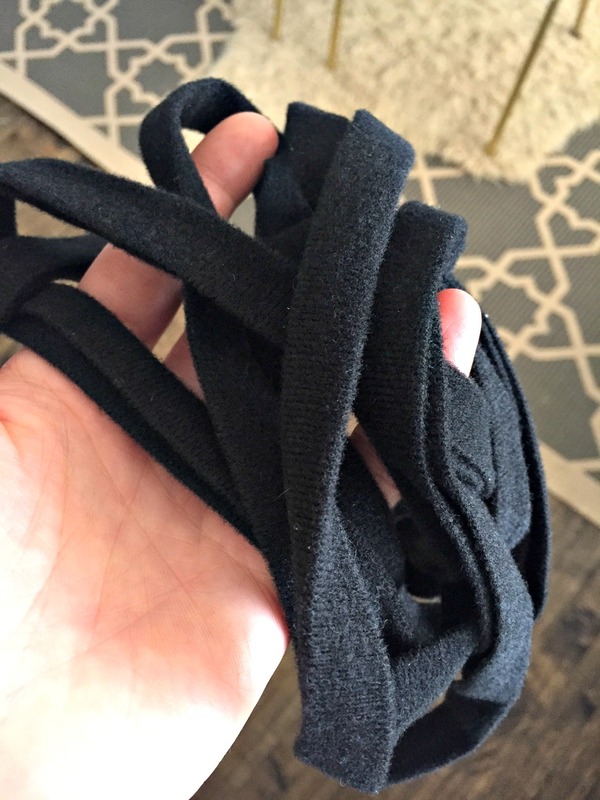 I picked up 3 yards of black felt banding at $3.49 per yard from my local fabric store. 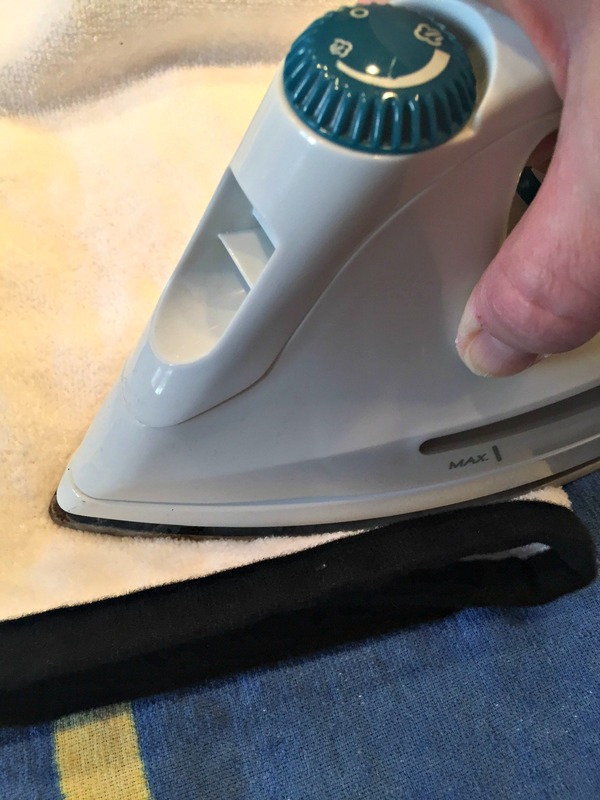 The felt banding was easy to sew in place, as it has built in pockets for the towel edge to sit in. After I heated up my iron, I removed the letter from the package. Pictured here is the back of the letter. 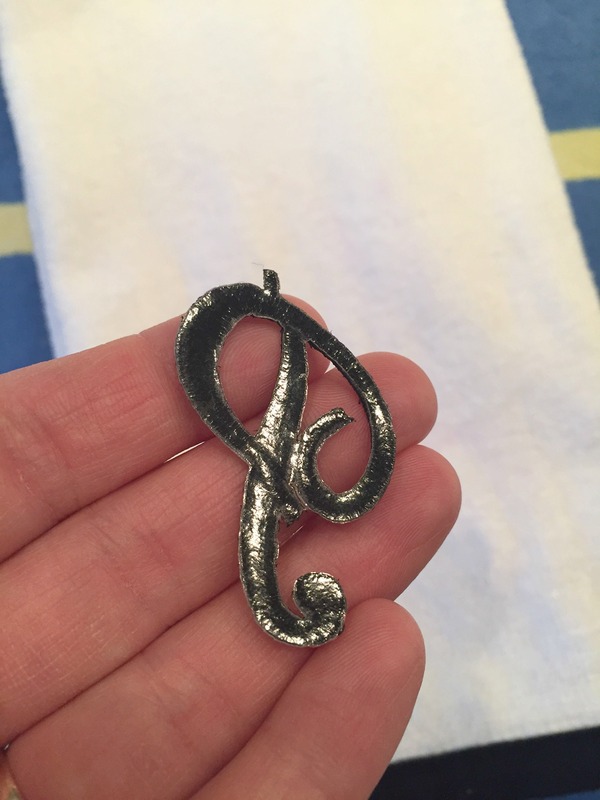 The shiny backing is actually the glue that gets activated when the iron is placed on the letter. I waited about 7-10 seconds with the iron in place, which was more than enough time to secure the letter to the towel. 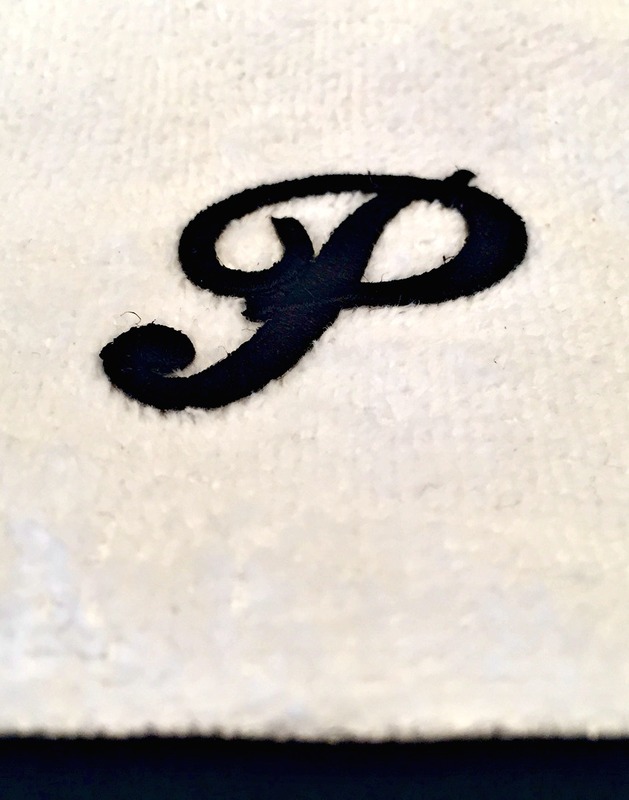 The P is now fully adhered to the towel. I absolutely LOVE how these turned out, and they were only a fraction of the cost of real monogram towels. The felt banding also makes these towels look way more fancy, and no one would ever be able to tell they came from a thrift store. I can’t wait to show you the full reveal pics next week. Make sure you check out the other rooms my friends have been busy working on. I absolutely love how those towels turned out. I didn’t realize they made iron-on monograms. I also love the DIY artwork. You are doing an amazing job in here. Can’t wait for next week’s reveal! Wow! I still cant believe you did this bathroom on a budget. It’s so beautiful. And I am glad you went for the gold leaf in the art, it really makes a big difference! Wow! I love both of these project for your bathroom makeover. 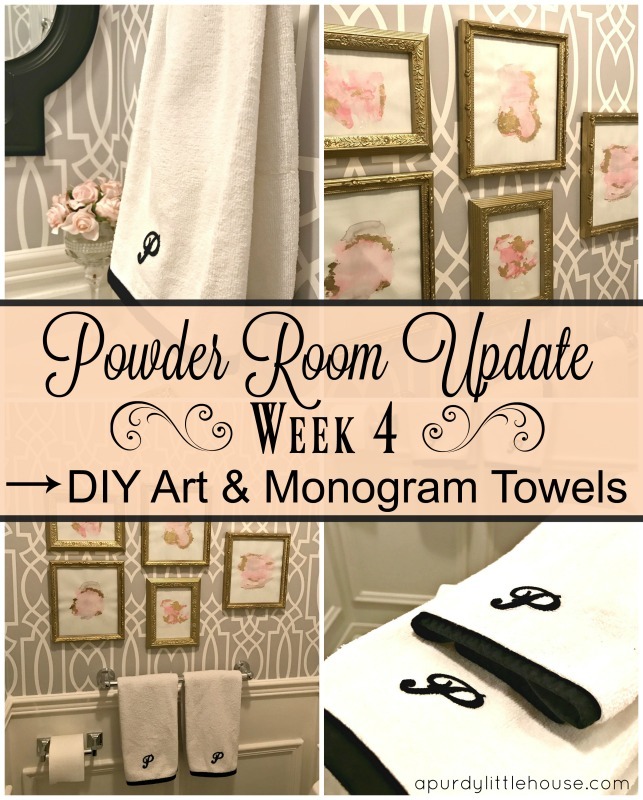 The watercolor and gold leaf artwork is so pretty and the monogrammed towels are fantastic! how creative with the towels! And I LOVE the art and frames. the room is coming together wonderfully! I love what you did with those hand towels, very clever! I am obsessed with that art work you made!! SOOO pretty!! I love the pictures on top of the stencil – it comes together beautifully! 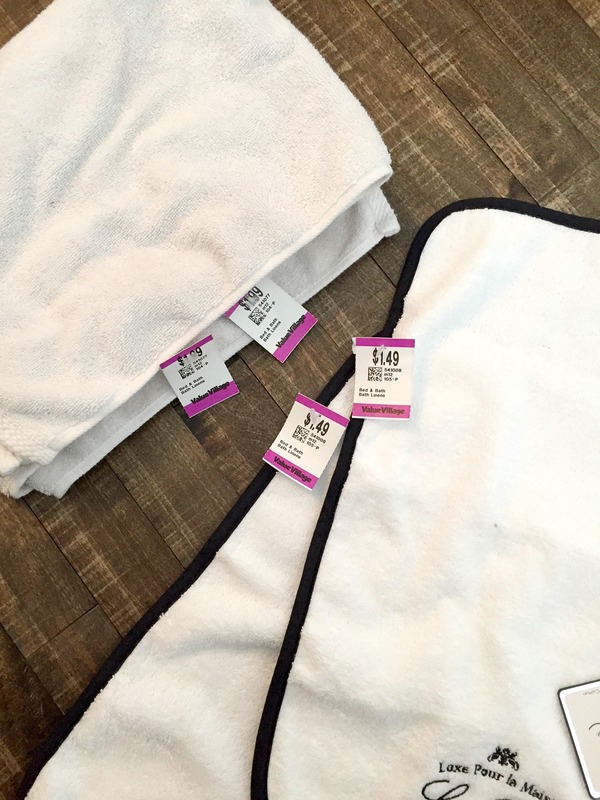 And the details you added to the towels are the prefect touch! Sue, I am in absolute love with what you have done so far in the bath room. 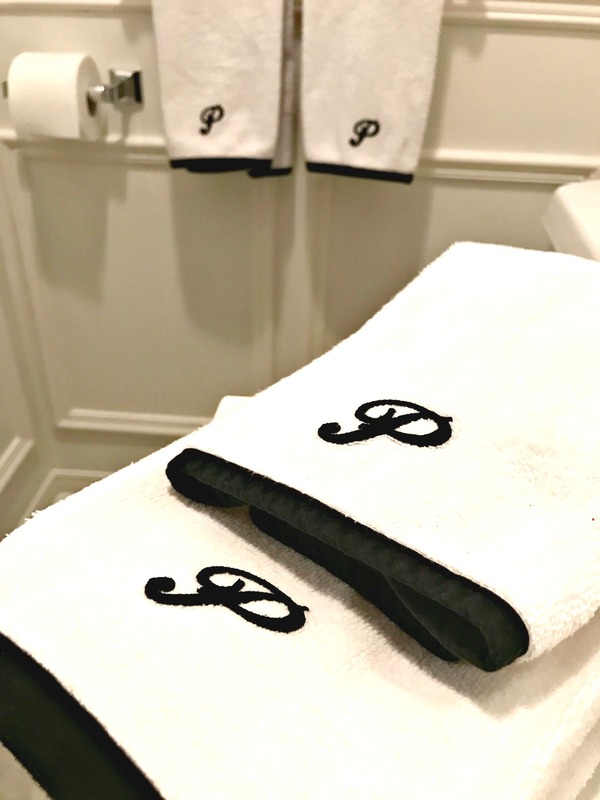 Love the monogrammed towels. Thanks for the idea.